Liverpool believe Djibril Cisse could be playing again by November as the striker begins his recovery after breaking his leg on Wednesday. Cisse will miss the World Cup after he broke the tibia and fibula of his right leg in France's friendly with China. "He's had the operation and everything has gone in a very straightforward fashion," Liverpool doctor Mark Waller told the club's website. "I wouldn't be surprised to seeing him playing as early as November." 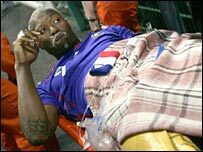 Cisse, 24, missed most of the 2004-05 season with a similar injury to his left leg sustained at Blackburn in October 2004. "The fracture has been repaired with some metalwork in his leg in a similar way to what he had when he broke the other leg in 2004," said Waller. "This fracture is not as severe as the previous one. "The last time he broke his leg, it took him just 164 days to recover completely - which was just over five months. "But this time we're expecting him to recover even quicker. When we talk about him being back, we mean back playing first team football." Cisse was knocked off balance by a defender 10 minutes into the game against China and fell, his right leg twisting under him and buckling above the ankle. Cisse had been linked with a move to Marseille after the World Cup, but any transfer has now been put on hold. During qualification for the finals Cisse was France's leading scorer with four goals.